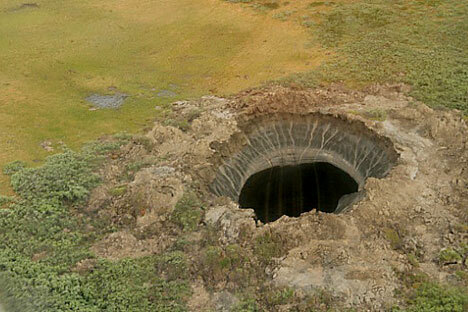 Noted scientists tell RIR that the holes found on the Yamal Peninsula that have sparked so much interest on the internet have no known analogues on land, but could indicate a serious degradation of the permafrost, with global implications. “For me the biggest surprise was that the location appeared untouched by any kind of human activity. My first thoughts were that this hole was the result of an accident that occurred whilst drilling for natural gas,” Leibman explained to RIR. “Around 10,000 years ago it was warmer than it is now, so the permafrost had melted in more southerly latitudes. The permafrost at these latitudes is not solid any more, but is isolated, and interrupted by river valleys and under deep lakes. Whatever needs to escape [this refers to methane - RIR] has already escaped long ago. There is no longer any need for the gas to fracture the permafrost since it can escape via the rocks, which have thawed out,” Leibman explained.